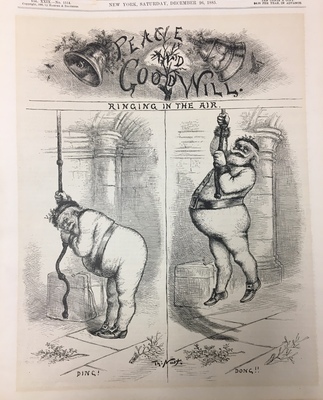 Peace and Goodwill - "Ringing in the Air"
Editorial cartoonist considered by many to be the father of American cartoons. Page from Harper's weekly - Journal of Civilization. Vol. XXIX - No. 1514. Copyright, 1885, by Harper's & Brothers. New York, Saturday, December 26, 1885. Ten cents a copy, four dollars per year, in advance.